In all the three departments, whether it was batting, bowling or fielding, the team showed their prowess. But the real surprising factor was the dynamic duo, Kuldeep Yadav, and Yuzvendra Chahal. How often have we seen that spinners making an impact on the overseas tour? The milestone of India's first bilateral ODI series against South Africa in South Africa was the success of India's wrist spinner duo who picked 33 wickets between them. It's a great sign before the World Cup 2019. Virat Kohli's hunger to win has taken this Indian side on a different level. If the side continues to play like this, then there is a healthy chance of bringing the big trophy home. This series, numbers have clearly shown what this team is really capable of. Here are some stats and numbers which proves that the preparation of World Cup 2019 is right on track. Virat Kohli was as usual at his best, smashing an astonishing 558 runs in 6 innings with a whopping average of 186. Shikhar Dhawan was in sublime touch too, smashing 323 runs at an average 64.60 in 6 innings. Rohit Sharma was hot and cold throughout the series, though he managed to score a winning century, which helped India to win the series. Ajinkya Rahane, the most talked person in the series, was not selected for the first two test matches, but when he got his chance he made sure that India won. He made a valuable contribution in the second innings the sole Test that he played. In ODI, apart from one game, he was not able to convert his start to a big score. If he has to cement his place in the current ODI team, he has to score big and score in a consistent manner. There is no doubt about the talent he possesses but he has to show by scoring lots and lots of runs. Surprisingly this time, it was India's bowling unit that made the difference. The wrist spin-twins Kuldeep Yadav and Yuzvendra Chahal shared 33 wickets between them at an astonishing average of 31 in 6 matches. It was really amazing to see how both these players used the conditions to their advantage, as it is not easy for a spinner to get this much wicket on such surfaces. 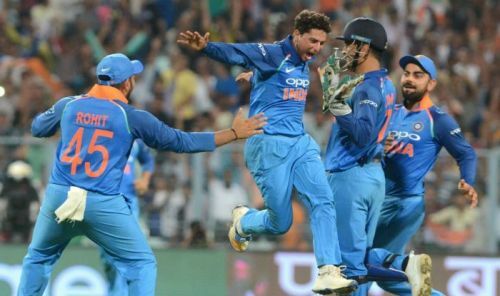 They were not afraid of tossing the ball up as they invited the batsman to plat the shots, with all the batsman taking their chances and throwing their wickets away. Another surprise package was Hardik Pandya, though he didn't contribute with the bat, he made sure that he did not give too many runs. Bumrah was as usual at his prime, with his economy was under 4 in 6 matches while managing to pick 8 wickets in those matches. With another ODI series win to the team's name, Ravi Shastri would be a happy man and why wouldn't he be. He offered full credit to Virat Kohli for the turnaround. "That's the beauty of this team on this trip where I feel proud as a coach about my boys is the intensity they showed. Entire credit should go to the leader because he has led from the front, first with his batting and then with his intensity, which makes other people in the team also up the ante."